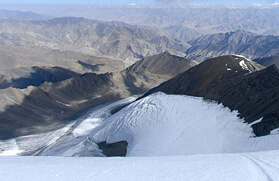 Stok Kangri at an elevation of 6,153 meters is one of the highest trekable summits in the Indian Himalayan region; Stok Kangri is considered safe for trekkers having prior experience of high altitude trekking, especially over 5,000 meters. 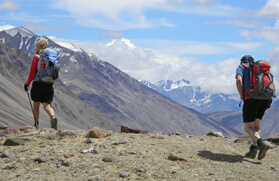 The Stok Kangri climb and Markha valley trek is one of the toughest treks in the Ladakh region that requires a good deal of mountaineering and climbing skills. The trek is, therefore, not recommended for those who are seeking to take the exotic ambiance of the hills, with all the comfort of urban existence in a stone throw distance. This trek is a serious pursuit of Ladakh and the views compensate for all the hardships that one has to bear while camping on this high altitude cold desert. The initial trail passes through the horrendous Hemis National Park followed by Markha valley which includes crossing numerous gorges, rich bed of barley and mustard fields. As the trail passes through high altitudes, cutting through narrow ridges, rocky tracks and barren topography and thereafter encounters a thick bed of snow, it becomes strenuous and dangerous combating with deadly moraines and blizzards. 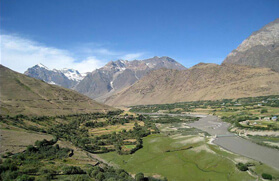 The Stok Kangri climb and Markha valley trek commences from Chilling, which is approximately a 4 hours drive from Leh. After one day of acclimatization at Leh and paying a visit to some of the ancient monasteries of Ladakh region, namely the Shey, Thiksey and Hemis the trekking tour wheels to Chilling. Thereafter, crossing the Zanskar River the Stok Kangri and Markha valley trek heads to Skiu, which is the gateway to Markha valley. From Skiu the route slips through the deep Zanskar Gorge and Ganda La leaving behind the traditional colours of Zanskar region. The journey then heads to Markha valley moving through several more derelict monasteries. The vast terrain with patches of scant vegetation along the river banks surrounded by barren and desolate highlands makes the journey more beautiful for the questers. The trek continues further deep into Hangkar village and thence leads to Nimaling. After crossing the Kongmaru La at 5,100 meters the trail falls upon the snaky and tricky tracks. 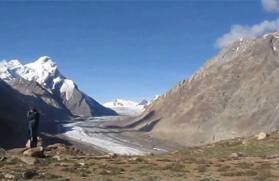 From the vicinity one can capture the panorama of the eastern Karakoram range, while the southern cascade is dominated by shapely Kang Yatze. As you descend a little further, you enter a narrow gorge, which presents wonderfully contorted rock formations, pillars and buttresses and colours. The trek thereafter skirt towards Stok village en route to Martselang and turns to Stok Kangri base camp. 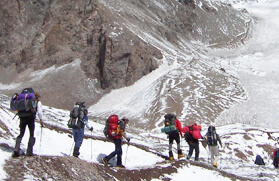 The ascent to the summit is followed by a day or two of acclimatization at the base camp. Arrive Delhi late evening and transfer to the hotel. The most powerful of the monasteries in the vicinity of Leh, and belong to the Kagyupa Buddhist sect. Large areas of the surrounding farmland are controlled by the monastery. We are now acclimatized and ready to begin trekking. 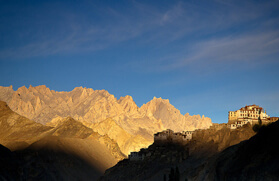 Our brief introduction to the Tibetan Buddhist world of Ladakh (which has been many times threatened by invading forces over the years) will make us better able to appreciate the significance of the hill-top location of many of the monasteries which we will see on our trek through the Markha Valley. A 40 kilometer drives along the road towards Srinagar and Kashmir to Nimmo, where the chill waters of the Zanskar River meet the Indus. We turn onto a dirt road, cross the Indus on a sturdy bridge and then follow the left bank of Zanskar River through a gorge to Chilling - A village well known in Ladakh and Zanskar for the skill of its silversmiths. Chilling is also the gateway into the Markha valley. We camp at Chilling and spend an easy afternoon. Crossing the Zanskar by way of a box and cable bridge, we meet our trek crew and our pack-ponies, who will have traveled to this meeting place, via the Markha valley, a day in advance of our arrival. After sorting out the loads for the ponies, we begin our first day of trekking along a narrow trail on the right bank of Zanskar gorge, to a point where the Markha River meets the Main valley. We climb to cross spur and can look southwards to where the impressive Zanskar gorge disappears around a corner. 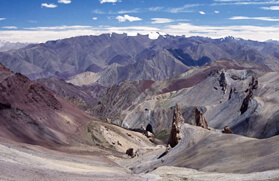 A red - painted collection of chortens on the far side of Zanskar and faint indication of a trail point to the existence of route into Zanskar. In face the only time it is practicable to follows the Zanskar River southwards as far as Padum in Zanskar is in the depths of winter. When, for a few short weeks the frozen river allows reasonable progress through the gorge to be made but that is another story. At this point, we turn towards the southeast into the Markha valley and continue until we reach the irrigated trees and fields of the hamlets of Skays and Skiu, where we camp for the night. The main trail into the Marks valley from the north, over the Ganda La, joins our route at this point. There is a small monastery in Skiu and a derelict fortress/monastery on the cliff above our riverside camp. Crossing and re crossing the Markha stream, we make a long day's walk of around 7 hours to the 30 or 40 houses of Markha Village (c.3800m ). The trail passes through quite lush vegetation at the riverside, whilst the upper valley- slopes are uniformly brown and dry. There are bridges at many of the more difficult crossing places. En route we pass several more derelict monasteries, which are often quite difficult to pick out, high on the valley sides. There are also a number of well maintained chortens and prayer walls and at least one good example of wolf trap. During the winter, wolves and snow leopards are a nuisance in these high valleys, becoming bold on account of their hunger descend to the villages and prey on domestic animals. The local form of wolf trap is a stone enclosure with overhanging sides, into which is placed live or dead animals baits. If a wolf a jumps into the enclosure to eat the bait, is unable to escape and is stone to death by the local people. We also pass a couple of isolated house, one of which headdress known as a peraq. On a hill to the north of Markha there is a small Gompa. The resident monk will be happy to show you the ancient wall paintings and festival masks which are contained within this lovely old monastery - reputedly one of the oldest in Ladakh. The trek from Skiu to Markha is as good a day's trekking as any in the Himalayas. We continue above Markha Village, trekking eastwards, deeper into the Markha valley, to a good camping place at Hangkar. During today's 4 to 5 hour walk we pass more impressive monasteries, some ruined and some intact, a testament to the fact that this valley was once more populous than it is today. Hidden away between the two hamlets which make up Hangkar village, high on a rocky spur is another remarkable ruined monastery. In this high valley we are likely to see small herds of blue sheep (Bharal) which often come right down to the river to graze. Leaving Hangkar, we now have good view of a prominent snow peak at the head of the valley. This is Kang Yatze, a 6400 meter high mountain which has a subsidiary summit at around 6100 meter which is very straightforward and often climbed as a trekking peaks its own right .Passing another well maintained wolf pit we cross the Markha stream on the last bridge that we will see and start steeper climb up towards the high plaints known as Nimaling, Today we will climb from around 4000 meters to a camp at 4600 meters and we will feel the effects of altitude. 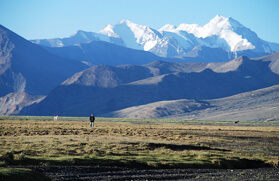 The scenery opens out as we traverse around to the north side of Kang Yatze and look out for the pass which we must cross to return us to the Indus valley - the Kongmaru La is not immediately apparent from our camp beside the frozen upper reaches of the Markha stream. We trek up to the Kongmaru la (5100 mts) on a well marked trail which zigzags across scree for the final 250 meters to the pass - 2 hours ascent. From the pass there are views north to the hills of the eastern Karakoram and China, whiles the southern panorama is dominated by shapely Kang Yatze. Descending, we enter a narrow gorge, which presents wonderfully contorted rock formations, pillars and buttresses, some of them remarkable colours, reds through to green and grey. The best trail crosses from one side of the valley to the other time and time again - and we are obliged to cross the growing stream many times. Except for a small level area just beyond the pass. The first reasonable camping place is at Chuskirma (which means sour water), where there are a couple of stone huts and some rough pasture. We continue our descent, passing a couple of impressive house, the highest in the valley, and then another section of rocky gorge. The valley opens out a little as we near the picturesque hamlet of Sumdo and soon thereafter we reach a jeep road which is in the process of being built into the valley. We follow this for an hour until we can see the houses and trees of Martselang, which is actually on the main Indus valley road. 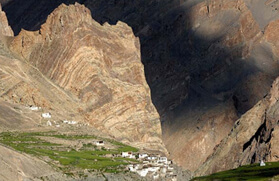 From here we opt to skirt above the valley on a train which leads after about an hour, via a number of impressive chortens , into the tributary valley below Hemis monastery, Here there is a good camping place in a field of large trees and unusual large. Those who are not tired of Gompas can re-visit Hemis. In the morning we transfer by jeep to Stok village which lies immediately south of Leh, on the other side of the Indus valley, here there is a royal palace, where the recently crowned young Ladakhi King lives, and there is also small museum which contains religious artifacts and ceremonial clothing belonging to the royal family. There is time to look around the palace and monastery at Stok before lunch and then we begin our walk-in to Stok Kangri with an easy 2 hour trek. Even so close to the Indus valley we are already in a high and wild area which is visited only by climbing groups and by the local people who spend some of the summer months in picturesque villages of stone huts, from where they tend their flocks of sheep and goat. A four hour trek takes us up to the base camp area for Stok Kangri. The very pleasant campsite is on a grassy area beside a number of Mel water streams. In the afternoon we can walk above our camp for views of the surroundings peaks: Stok Kangri (c.6150m), gulap Kangri, Parcha Kangri and many others. A rest and acclimatization day to make sure that the group is feeling ready to make the ascent of Stok Kangri. The group will make the half-four climb up to the pass at 5000 meters above our camp, possibly taking the climbing hardware which can be cached at the passed in preparation for the followings day's climb. We have allowed two days for the ascent, to try to give everyone a chance. Of climbing the peak. This will also allow for contingencies such as poor weather etc. Depending on the fitness of the group, we will either go for a one day ascent from our base camp, or choose to establish a high camp, from which we can make the summit push on the following day. Much of the climb involves walking across scree and boulder slopes, which are likely to be bare of snow by the time of our trip, unless there has been un seasonal snow - fall. 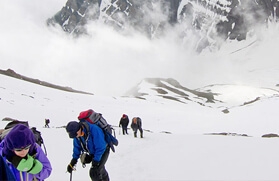 The final part of the climb will involve the use of crampons and ice-axe on snow slopes up to about 35 degrees. Although this is not a technically demanding climb, at an altitude of over 6000 meters peaks in Tibet to the north-east, and including a bird's eye view of the Indus valley and Leh below us to the north. If we manage to climb the peak on the first day, there may be opportunity to attempt one of a number of other easy peaks above our base camp. From our base camp, we will descent directly to the upper reaches of Stok village, with its fields of barely and buckwheat. We meet our jeeps at Stok, for the back to Hotel in Leh.